London, UK – March 2012: International architecture practice Kohn Pedersen Fox Associates (KPF) is hosting Moments in Construction, a new exhibition of works by Japanese photographer Hiroyuki Suzuki – to be held from 26th March to 25th May 2012 at KPF’s Covent Garden gallery space. Hiroyuki Suzuki started his career as a photographer in 2006. Since then, Suzuki’s core concept A Moment, has taken him to construction sites around the world in an ambition to capture the fear and instability – but also the hope – he sees as intrinsic within these sites. Suzuki’s series of black and white images record unique, singular moments within the slow advancement of major building works across the globe, such as Metro in Dubai, D Glide Slope at Tokyo International Airport, Tokyo Gate Bridge, and Metropolitan Expressway in Shinagawa. Combining a selection of works taken in Shanghai (2007) and Tokyo (2010), Moments in Construction depicts the rough materiality and dynamism unique to construction work. The imposing presence of concrete masses and steel structures portray the magnitude and uncompromising grit of construction work, while also capturing the progress and innovation these buildings ultimately signify. Symbols of the dense, overcrowded conditions in the Japanese capital, the construction sites themselves are similarly complex, multi-layered environments from which the buildings that shape our cities emerge. Suzuki found that these buildings “took his breath away”, and that by training his lens on the contained energy inherent to the construction process, his photographs succeed in portraying the beauty of incompletion whilst also celebrating the magnitude of the finished structures they will soon become. Suzuki’s ability to unlock the latent optimism within these industrial spaces is particularly evident in the case of the Shanghai 2007 photographs, which involved a challenging outdoor ascent by Suzuki to the summit of KPF’s 492-metres high World Financial Centre in minus weather conditions. One year after the Great Tohoku Earthquake, Suzuki’s photography represents the power of the rebuilding process and the ability of our urban civilisation to endure, whilst also expressing thanks to supporters from around the world for their help following this natural disaster. Paul Katz, KPF’s Managing Principal, said: “Asia is currently undergoing a period of unparalleled transformation and growth, and it is vital that its modern cities evolve accordingly in order to meet the demands of its expanding population. Construction work is not purely mechanical process, but exists as part of a larger philosophical, economic and ecological dynamic, which ultimately comes to inform the spaces we inhabit and the ways in which we live. 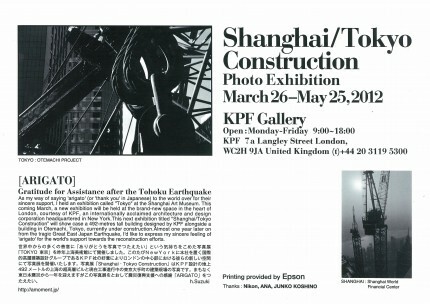 This exhibition has been kindly sponsored by JUNKO KOSHINO INC, Nikon, Epson and ANA. Born in Shizuoka, Hiroyuki Suzuki started his career as a photographer in 2006. Suzuki has exhibited at locations around the world including: Tokyo international airport (2007), Kodak Photo Salon in Ginza (2007), The John F. Kennedy Center for the Performing Arts in Washington, DC (2008), Cuba UNEAC(2009),Tokyo Gallery + BTAP in Beijing (2010), Nikon Salon in Osaka (2011), Shanghai Art Museum (2011), and a photograph exhibition in the Foreign Correspondents’ Club of Japan (2011). In addition to his photography work, Suzuki has designed and produced fashion shows for Junko Koshino at Paris Fashion Week and in various cities and countries around the world, including Beijing (1985), New York (1990), Vietnam (1994) and Cuba (1996). Kohn Pedersen Fox Associates (KPF) is one of the world’s pre‐eminent architecture firms, providing architecture, interior, programming and master planning services for clients in both the public and private sectors. Operating as one firm with six global offices, KPF is led by 20 Principals and 14 Directors. The firm’s 550 staff members come from 43 different countries, speak more than 30 languages, and include over 70 LEED accredited professionals. KPF’s diverse portfolio, which features over 70 projects certified or pursuing green building certification, comprises corporate, hospitality, academic, medical, research, civic, transportation, residential, and mixed‐use projects located in more than 35 countries. スポンサー : JUNKO KOSHINO INC, Nikon, Epson and ANA.